The best time to observe the moon this month is over the next few nights. Tonight (Jan. 12) the moon will be just past first quarter. This means that the sun’s light will be falling on the moon from the right, causing very oblique lighting all across the center of the moon’s disk, the boundary between sunlight and shadow known as the terminator. Look also for the perfectly oval crater Plato close to the moon’s north pole. This crater is 63 miles (101 km) in diameter and named for the famous Greek philosopher who flourished in the fourth century B.C.E. Because of the moon’s rapid movement around the Earth, the direction of the sun’s light changes greatly from one night to the next, making the study of the moon a constantly changing show. By tomorrow night (Jan. 13), the terminator will have moved westward. Ptolemaeus will be harder to see, though the dark floor of Plato continues to make it well-defined. New craters will be lit by the rising sun, such as Copernicus, near the center of the disk, and Tycho, near the moon’s south pole. These craters are named for two astronomical "greats" of the 16th century. Copernicus, 58 miles (93 km) in diameter with terraced walls, is named for the Polish astronomer Nicolaus Copernicus, who placed the sun at the center of the solar system. 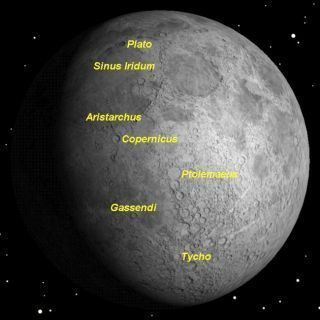 Tycho, 53 miles (85 km) in diameter, center of the moon’s brightest system of rays, is named after Tycho Brahe, the Danish astronomer who was the most accurate observer of his time. By Friday night, the sun will be penetrating farther westward, bringing into sunlight the graceful curve of the Sinus Iridum (Bay of Rainbows) on the north shore of the Mare Imbrium (Sea of Rains). These fanciful names were given to these features in the 17th century, before we knew that the moon was a barren, airless world. To the north, the walled plain of Gassendi is a striking crater. The crater, 68 miles (110 km) in diameter, is named for Pierre Gassendi, a 17th century French astronomer. Saturday night the sun will illuminate the crater Aristarchus. Although smaller than many craters at just 25 miles (40 km) in diameter, Aristarchus is one of the youngest and brightest craters on the moon. It is named for Aristarchus of Samos, third century B.C. Greek philosopher, the first to correctly place the sun in the center of the solar system.